It's been a busy couple of weeks for me, as evidenced by the lack of an update last week. I'm in the process of developing special project for Raging Swan Press, putting the finishing touches on Aspects of Axis, prepping for a new interview to be featured here soon, and some other things I can't quite yet talk about. But, I've dusted off one of my long-standing "to-do" entries for Pop Creature for you! This week's Pop Creature delves back into my love for FOX's Sleepy Hollow TV show. Full of humorous writing, just the right mix of drama and camp, and—most relevant—fantastic creatures! Today I'm focusing on the Sandman, a fiendish servant of the demon Moloch from episode 3 of Season 1, "For the Triumph of Evil." Modified for Pathfinder, the Sandman becomes a mythic devil in service to Hell, punishing those who dare break Hell's infernal contracts. To use this creature you'll need Paizo's Mythic Adventures, so be sure to get yourself a copy or check out their PRD. Let me know what you think of the Sandman in the comments section! 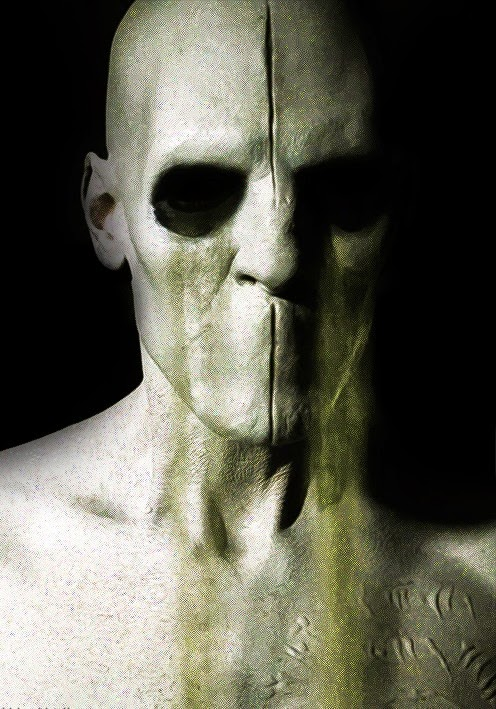 A mouthless humanoid with pale, waxy skin looms in silence. Sand pours from this creature's hollow eye sockets and its fingers end in wicked, black claws. Languages Abyssal, Common, Draconic, Infernal (can't speak); telepathy 100 ft.
Dream Sands (Su) By expending 1 point of mythic power, a sandman can fling sand from its eyes at a single creature within reach as a swift action, causing them to fall asleep. This ability functions as the mythic version of deep slumber (Will DC 24 to resist) but it is limited to only targeting a single creature. This is a mind-affecting effect. The save DC is Charisma-based. Dreamsense (Su) A sandman automatically senses the presence of all sleeping creatures within 100 feet. Detecting a sleeping mind counts as secondhand knowledge of that person for purposes of a sandman's puppetmaster ability. Once a sandman has sensed a creature's sleeping mind, it can track them with Survival as if tracking by scent. A creature that awoke within the last hour has a Survival DC of 10 to track. The DC increases by +2 every hour they are awake. Glass Vulnerability (Ex) A sandman's flesh is particularly vulnerable to the penetrations of glass and glass-based weapons. The sandman take 150% as much damage as normal from glass-headed piercing or slashing weapons. Mythic Spell-Like Abilities (Su) Three times per day a sandman may expend 1 use of mythic power to use the mythic version of one of its spell-like abilities. Puppeteer (Su) A sandman may assume control of a sleeping creature anywhere on the same plane by spending 2 points of mythic power and extending a portion of its consciousness into their dreaming mind (DC 24 Will save to resist). A successful save renders the target immune to that sandman's puppeteer ability for 24 hours. A creature affected by puppeteer is considered asleep for purposes that target sleeping minds, yet can take actions as directed by the sandman. A sandman may deliver telepathic commands as a free action long as it and the puppeteered creature remain on the same plane. The puppeteered creature follows the last given order until otherwise directed by the sandman. The sandman knows the distance and direction of the puppeteered creature and as a move action can shift its senses into the puppeteered creature, allowing it to see through the victim's eyes and speak through their mouth. While sharing a puppeteered creature's senses, the sandman is considered helpless and is unaware of his surroundings. If the sandman's body is slain while his consciousness is in another body, the sandman dies and the puppeteer ability immediately ends, waking the creature. If the puppeteered creature dies while the sandman is sharing its senses, the sandman suffers no averse effects and its consciousness returns to its body. This ability lasts for 1d4 hours if the target was naturally asleep, or for the duration of any magical sleep effect it may be under. If the puppeteered creature takes any damage or travels to a different plane than the sandman they immediately awaken and the effect is ended. This is a mind-affecting ability. The save DC is Charisma-based. Wisdom Drain (Su) Creatures hit by a sandman's claw attack must succeed on a DC 24 Fortitude save or take 1d6 points of Wisdom drain. The save DC is Charisma-based. Forged from the souls of the most heinous of oathbreakers and traitors, dream devils—or sandman, as they are more commonly known—are lashed into servitude as executors of punishment for those who would break Hell's infernal contracts and bargains. Terrifying creatures incapable of speech, a sandman is sent to stalk and torment a particular quarry that has broken a pact with Hell. The assignment of a sandman in response to a contract violation is not a lightly handled task and is typically performed only by an infernal duke or someone acting under the orders of one. The powers of a sandman are ones that rely on subterfuge and stealth, slipping into the minds of contract violators and affecting their dreams. A sandman never strikes unannounced, deriving a sadistic glee in tormenting a target with nightmares and other haunting visitations to remind them of their transgressions. Only after a prolonged period of torment will a sandman dispatch its quarry, typically by invading their victim's dreams via their puppeteer ability, then ordering their newly dominated sleeper to perform some suicidal task, such as jumping off of a high roof or performing a coup de grace on themselves. Those who survive such traumatic experiences often take such grim matters into their own hands to end their torment.